Really flies when coupled with Cubase, but those Rupert Neve transformers add a great twist, whichever DAW you use. Individual switchable Rupert Neve Designs transformer stage on four inputs. Onboard DSP with record and monitoring option. Onboard DSP limits the number of real-time plugins. Much as we like trying out new audio interfaces, in many respects the market has plateaued, making certain review outcomes, at times... predictable. So, when we saw that Steinberg had teamed with Rupert Neve Designs on the new UR interfaces, we were intrigued. The UR-RT2 and UR-RT4 couple Yamaha’s long established D-PRE mic pres with a switchable RND transformer stage. Nice idea, not least because the four transformers are individually switchable so you can select them as required. Beyond this, the UR-RT4, on paper at least, looks very similar to their well established UR44 interface, albeit with some new styling. What you get is a 24-bit 192kHz, six-input, four-output USB 2.0 interface with MIDI in and out. The unit is not bus-powered (an external PSU is included); it is iOS compliant, though. 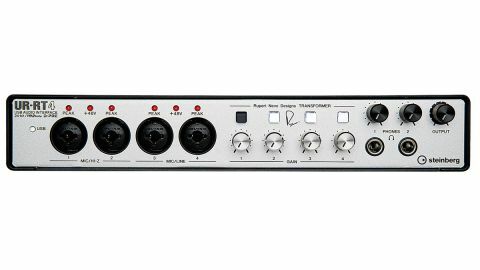 The four front panel mic inputs are on combination XLR/TRS connectors, accommodating two Hi Z inputs and two line inputs. Two further TRS line inputs round the back bring the input total to six. Here you’ll also find the two main outputs, four assignable outputs and 48V phantom power switches. On the front you get two separate headphone outputs, but input metering is pretty basic with simple input overload LEDs. The UR-RT4 handles zero latency monitoring via a software app (dspMixFx), and this also incorporates a suite of plugins. The first two can be applied to the input signal prior to recording or simply used as monitor effects. One nice feature here is the Channel Strip which includes a single knob ‘sweet spot’ feature for quick adjustment of EQ and compression. Much like the UR44 there are DSP limits - one amp plus two mono channel strips or four mono channel strips. Even so, it’s a great feature and more impressive when used inside Cubase, as all this functionality falls under the True Integrated Monitoring banner and is accessible via the hardware rack in Cubase MixConsole. And so to the transformers. These sit separately from the DSP aspect of the interface, and there’s no indicator in the software to say they’re active. In signal flow terms they are just before the AD converter, good news as all input types can be processed. The transformer adds a moderate amount of harmonic richness, and on the frequency analyser this is primarily 2nd, 3rd and some 4th harmonics, with the harmonics tailing off sharply after that. The overall level of said harmonics also tails off as frequency increases. This is great for adding weight to vocals but for me it’s the Hi Z input that benefits most, as you can easily achieve that classic punchy transformer DI effect for picked electric and bass guitar. The UR-RT4 is a great variant of the established UR44 interface, and the transformers are a great addition. Nevertheless, at almost twice the price of the UR44 those transformers are going to cost you some serious cash.